You’ll play as a soldier who suddenly got promoted over his ice queen superior officer. She made everyone’s life a living hell and now you have power over her. My goal for this one is to add more fun stuff for you guys to play with. I am thinking of adding a war system since you’ll be in command of an army and more player choices. Since this is only my second game, I’ll be careful to not overreach but I think you’ll enjoy the additional functionality. 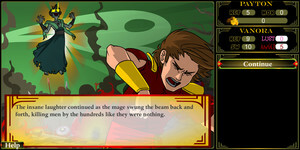 -Added a one and a half scenes to dueling Vanora.